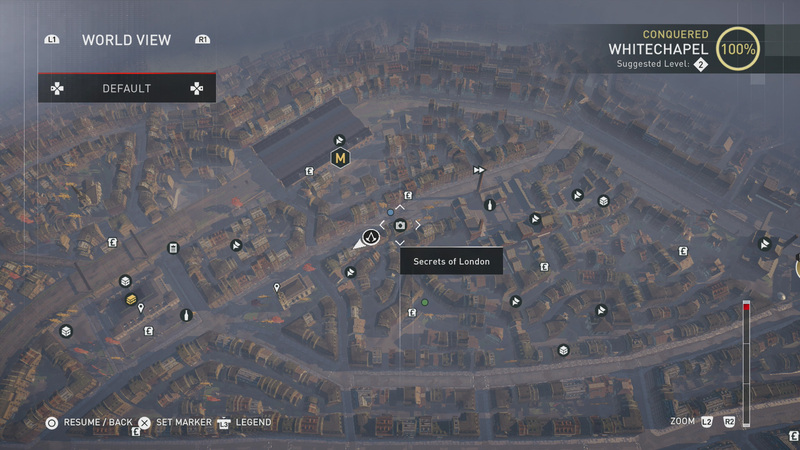 This guide will show you the locations of all Secrets of London in Assassin’s Creed Syndicate. These collectibles follow in the footsteps of the Nostradamus Enigmas, which are some very big shoes to fill. For players that are brave enough to go on this journey with us, the reward will be the Aegis outfit which is exclusive to Evie. 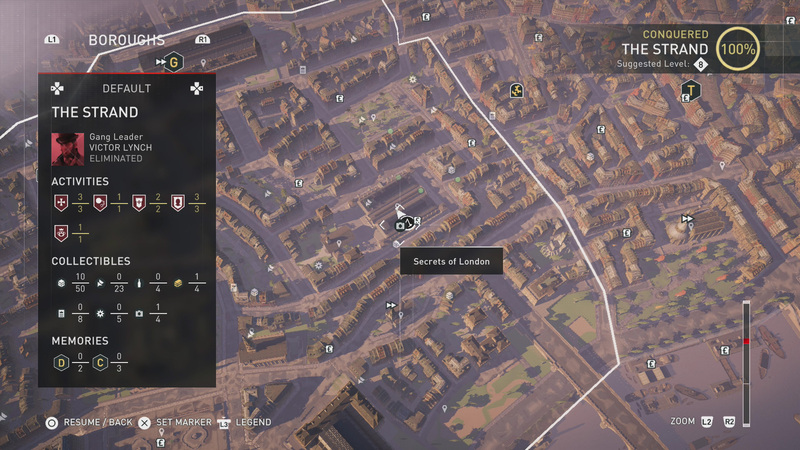 Players should also keep in mind that they will be given the first secret (we believe this is Secret of London #15) when they enter Reuge’s Vault. This is found on the west side of the City of London borough, represented by an icon that looks like a broken gear. 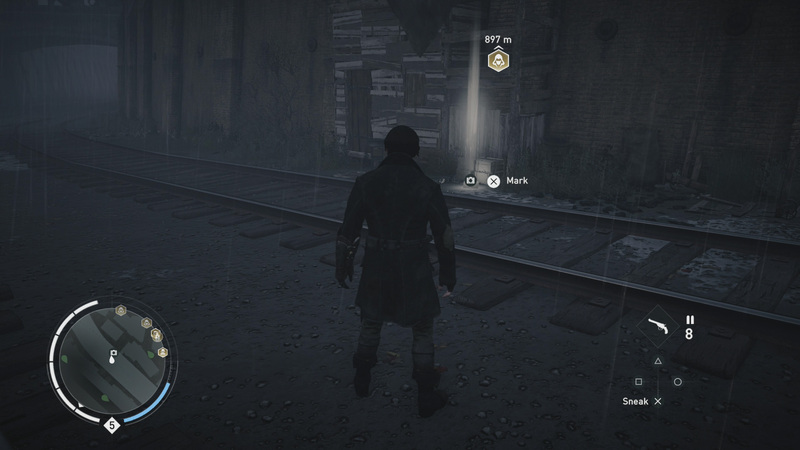 Head to that location and follow the tunnel, getting an explanation of what it is exactly that players must do. 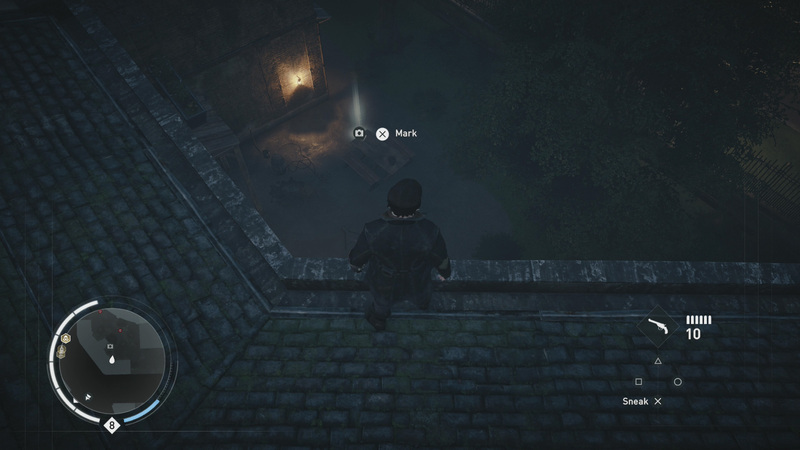 When you have all the collectibles, return to this location to complete your journey. 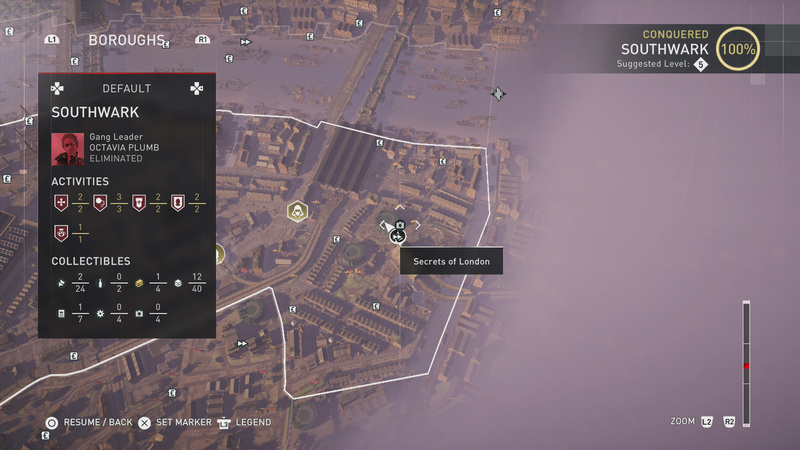 While we could break down each of the Secrets of London in order, this will often times take players to other regions of the map. 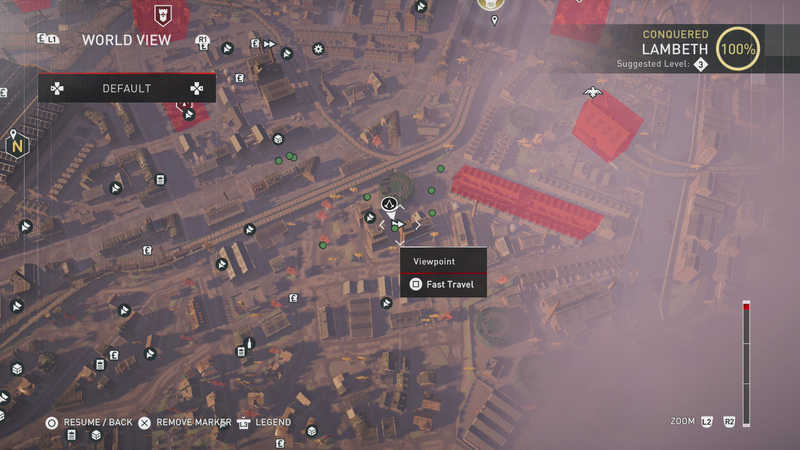 To reduce your travel time (and load screens for those that fast travel), we’re going to move from region to region, breaking down the locations in a way that saves you as much time as we possibly can. 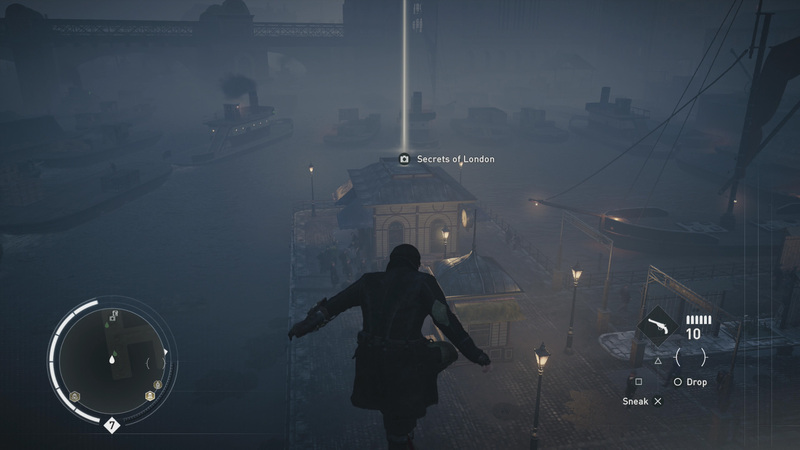 As you get closer to a Secret of London, music will begin to play, guiding you to the collectible. You may not hear it with Eagle Vision active. 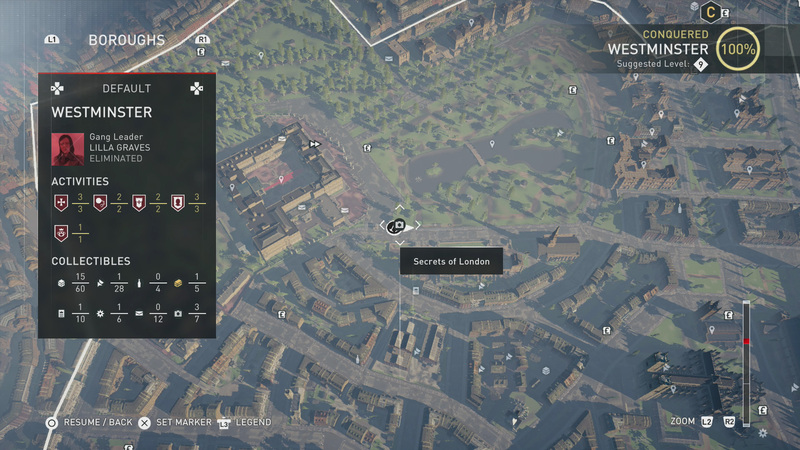 Use your Eagle Vision to spot Secrets of London. 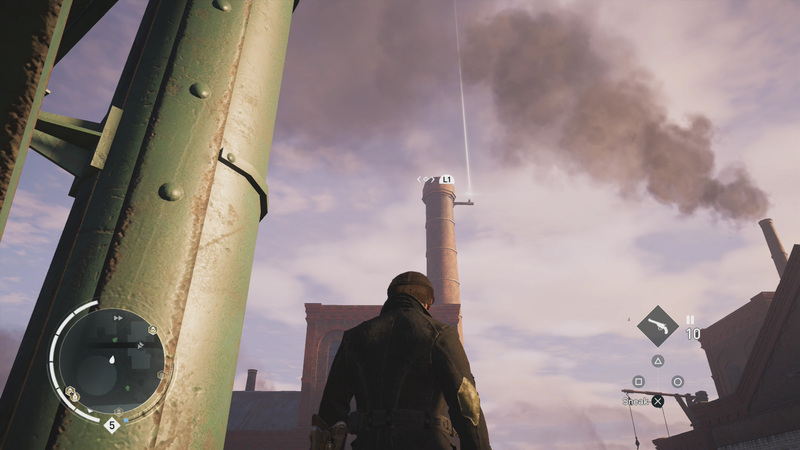 They are visible from a fair distance away. About 40-50 meters. 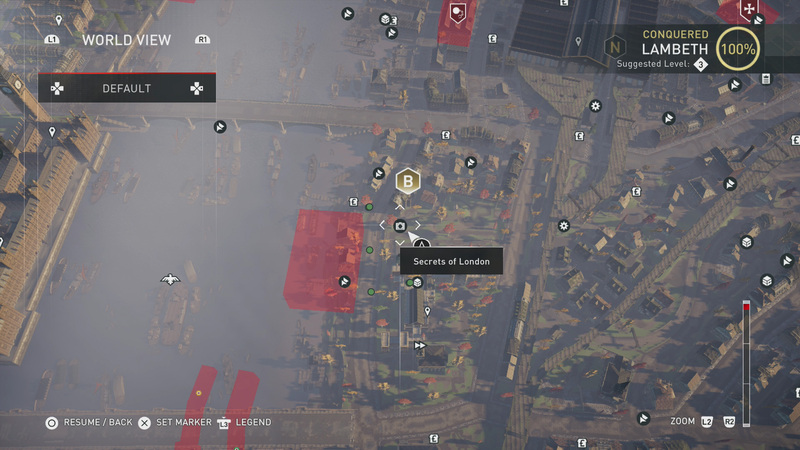 It helps to control the borough before you start looking for Secrets of London, as the Blighters won't be around to bother you. Fast traveling from one collectible to the next is actually slower than driving or using your Rope Launcher. 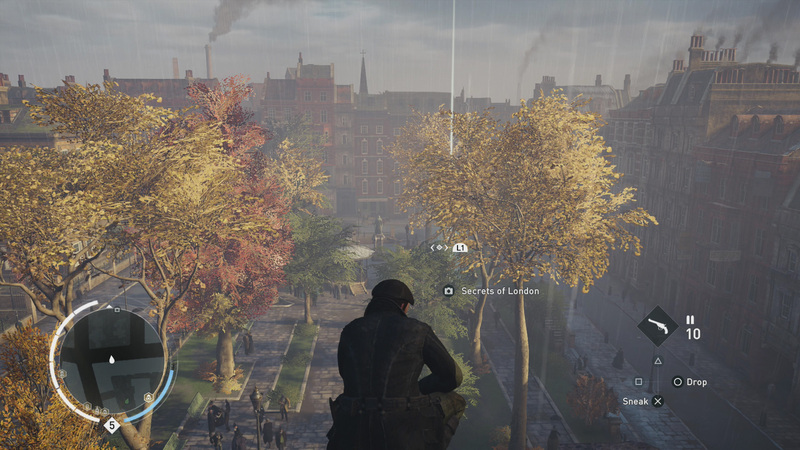 The load screens are killer. 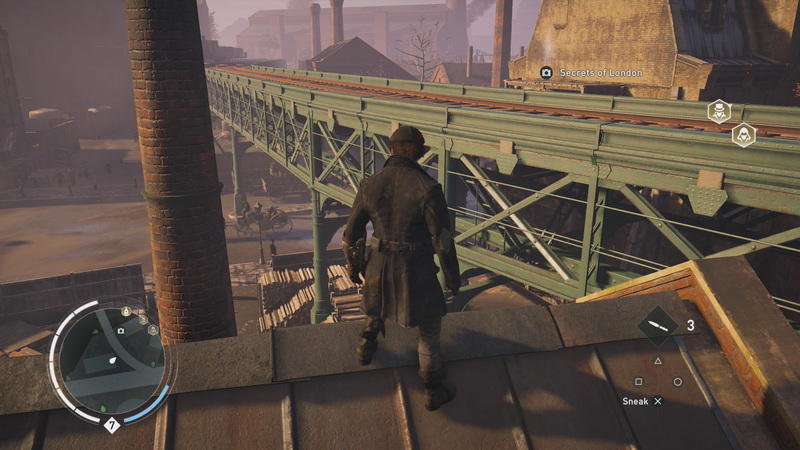 You can find this Secret of London on the north side of Whitechapel, at the foot of a broken wooden shack that sits only a few meters away from the railway tracks. 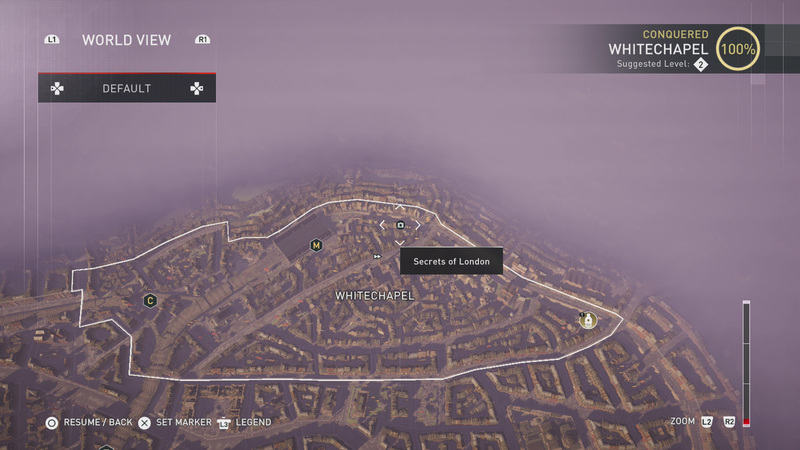 This Secret of London is located just east of the center of Whitechapel. You can find it in an alley, beside a wooden hut. We saw a man standing in this hut, but you may not. 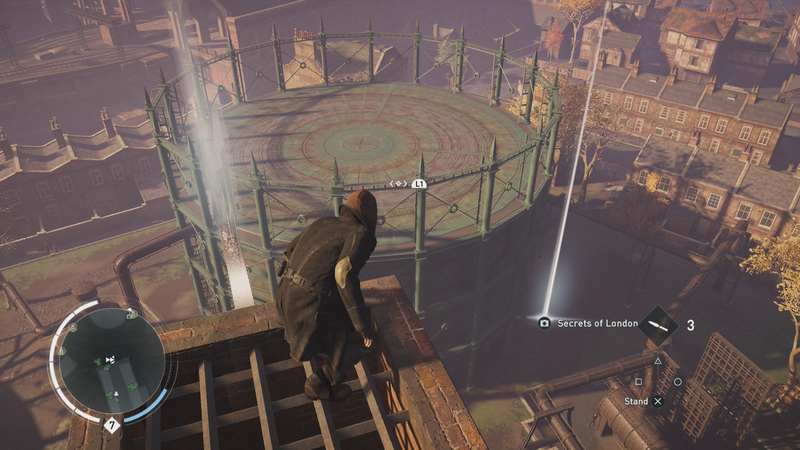 Players can find this Secret of London in central Whitechapel, just on top of a building that sits next to a main road. Be sure to view our images to see the exact location. 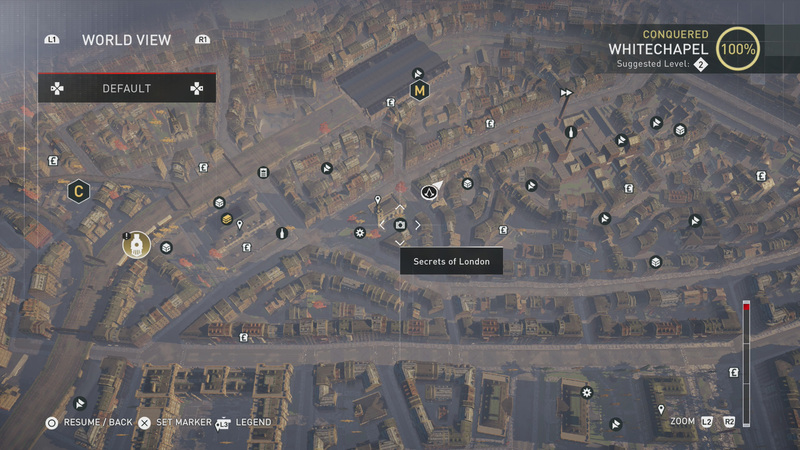 The final Secret of London in Whitechapel is located a few blocks south of the major railway station. You will find it in what looks like a small graveyard, at the foot of a tombstone. 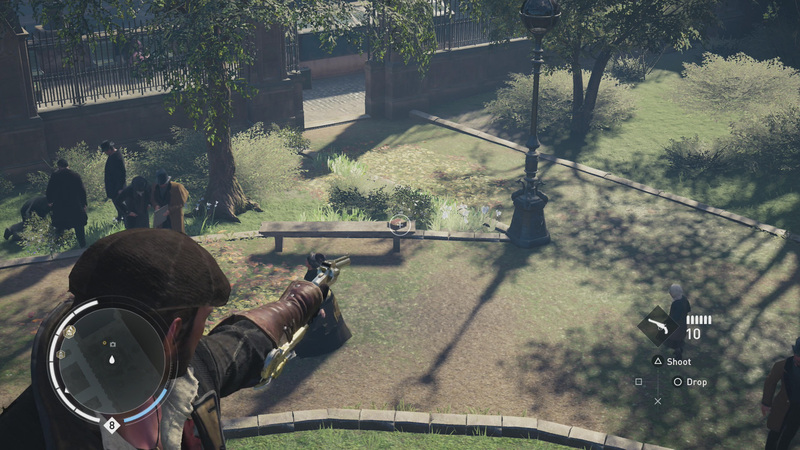 This secret of London is located on a bench, within a park that sits on the northern border of the City of London. Any further and you’d be in Whitechapel for this one. 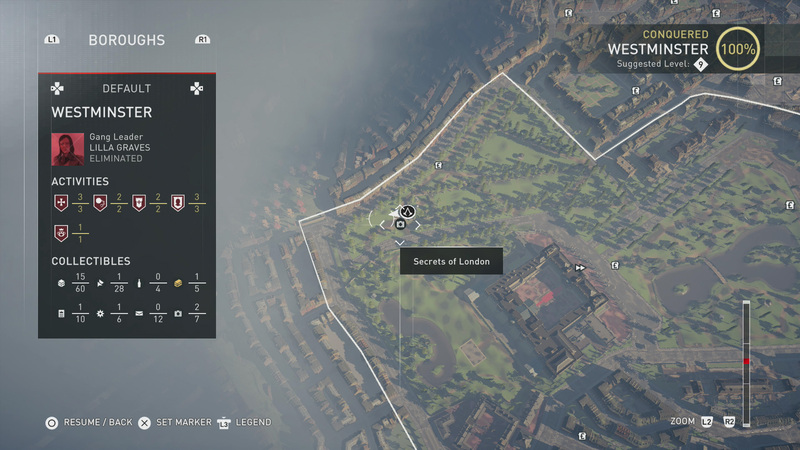 This Secret of London can be found in the southeast corner of the City of London region, just to the west of the railway tracks. It will be in front of a corner store, sitting on a stool. 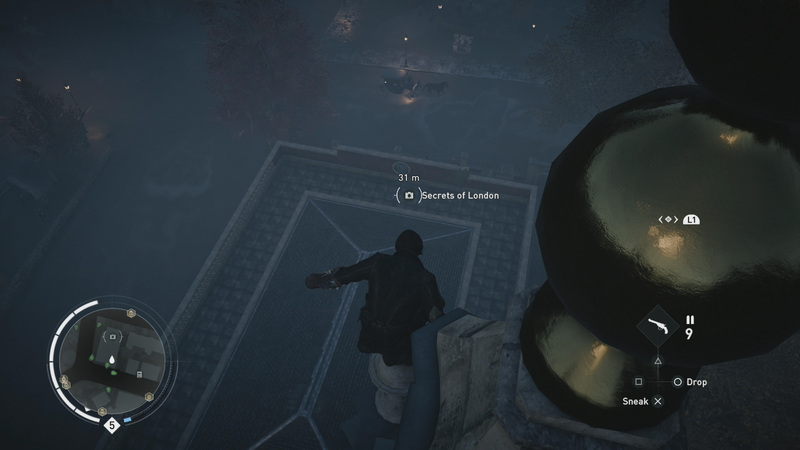 Just to the north of the City of London train station you’ll find this Secret of London sitting on top of a roof. It’s just below the Cockham Merchants sign. 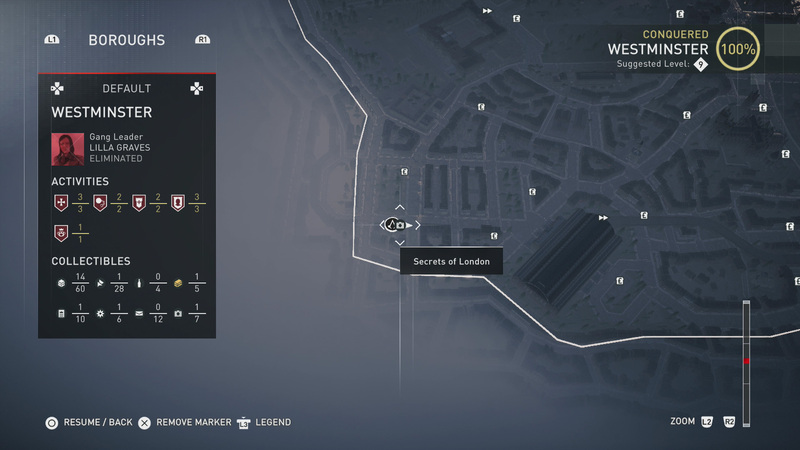 The final Secret of London found in the City of London region will be two blocks to the northeast of Reuge’s Vault. 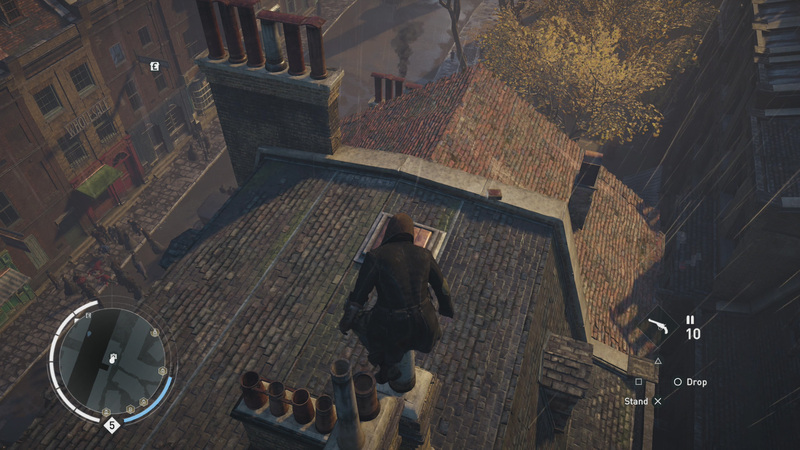 You will find it on a rooftop, on the southeast corner of the block. 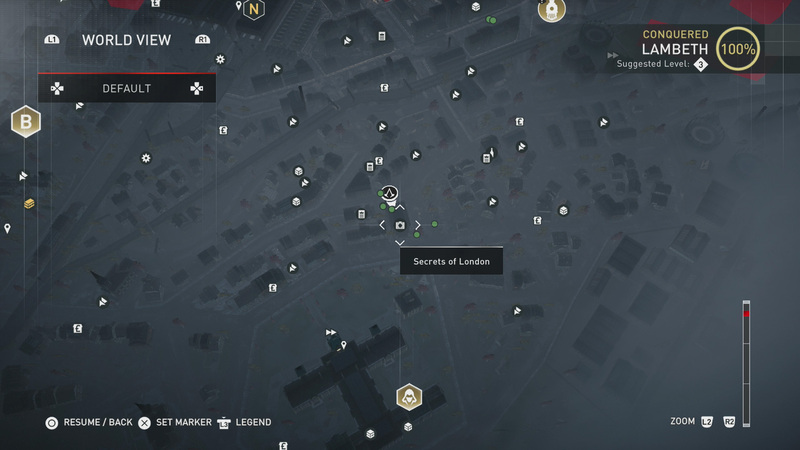 This Secret of London can be found in the northeast corner of London. 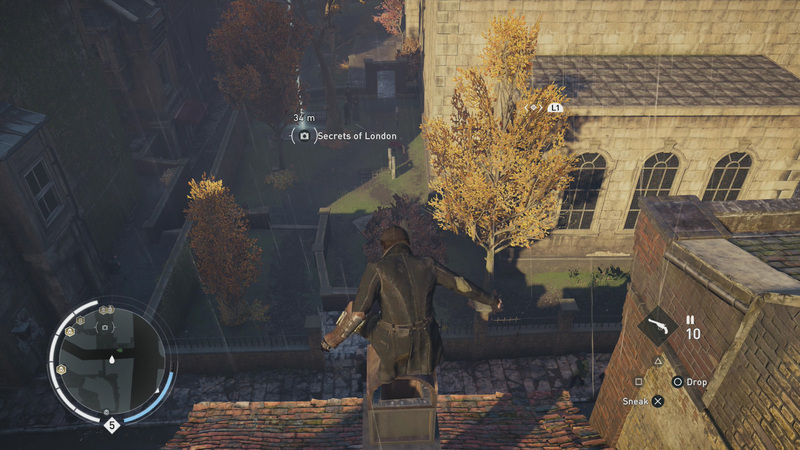 It’s extremely easy to find, as it sits on top of a Viewpoint where you can synchronize and take a Leap of Faith. 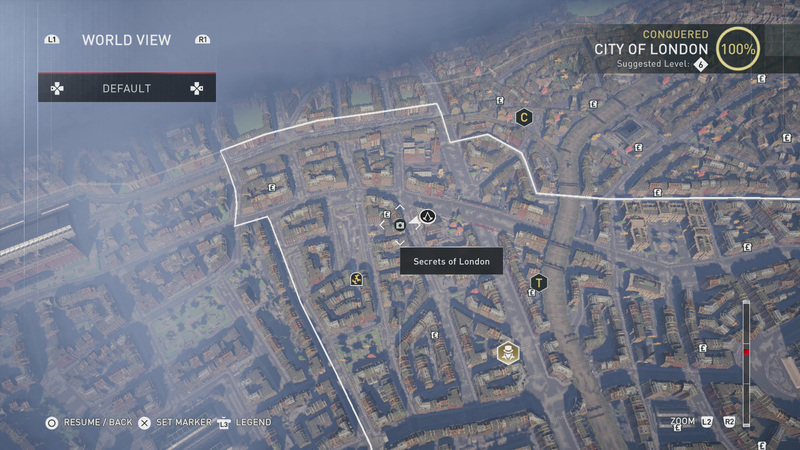 This secret of London is just north of the northeast corner of the park that sits in the southcentral region of Lambeth. 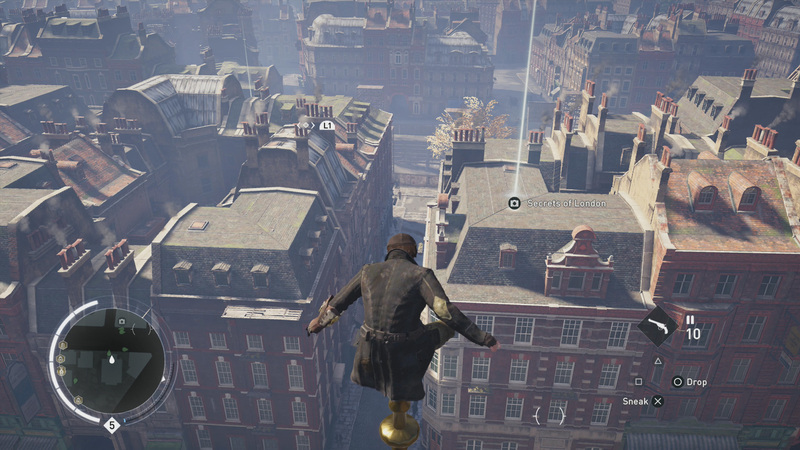 You’ll find it sitting on a rooftop. 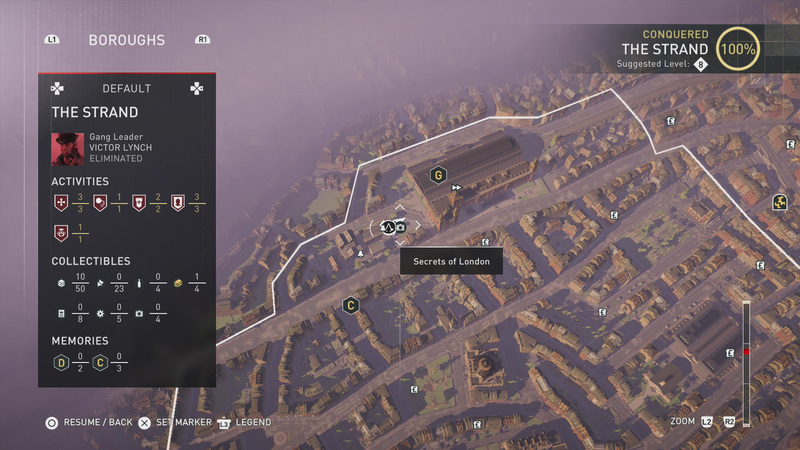 A Secret of London can be found in the southwest corner of the Lambeth region. 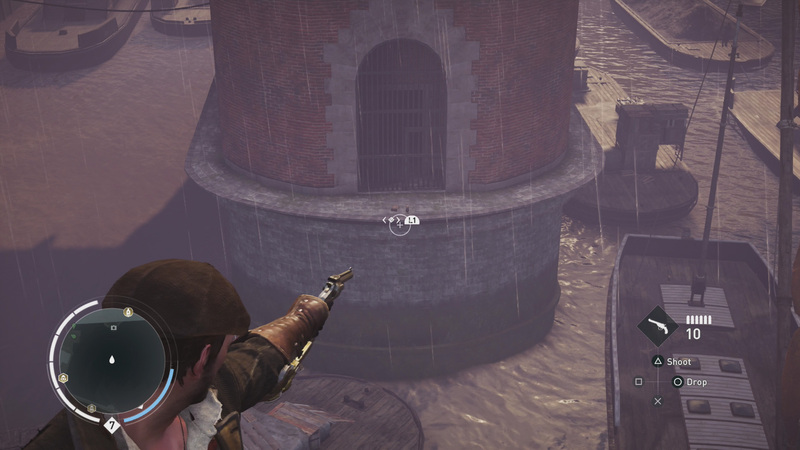 You’ll find it sitting on some rope, at the side of a building that stands next to the docks. 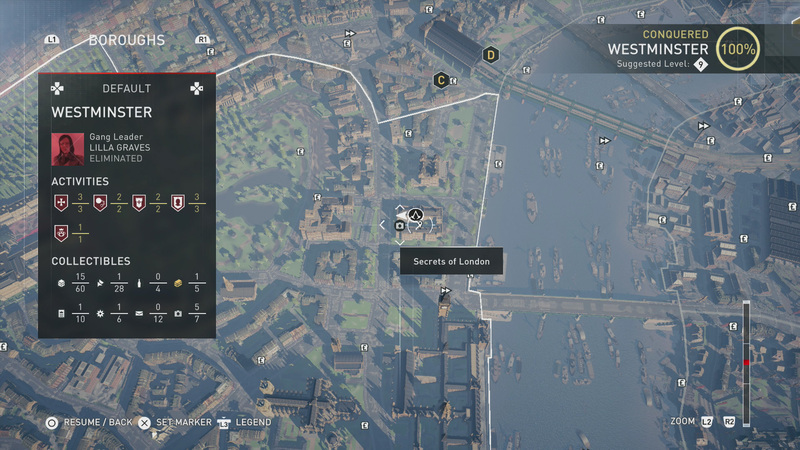 The final Secret of London that players can find in Lambeth is in the northwest corner of the region. 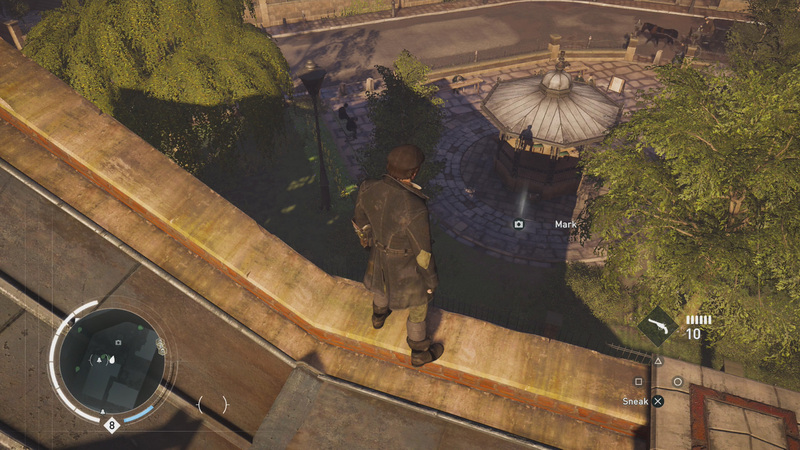 Look for a park with a water fountain, and the collectible on a tree stump nearby. 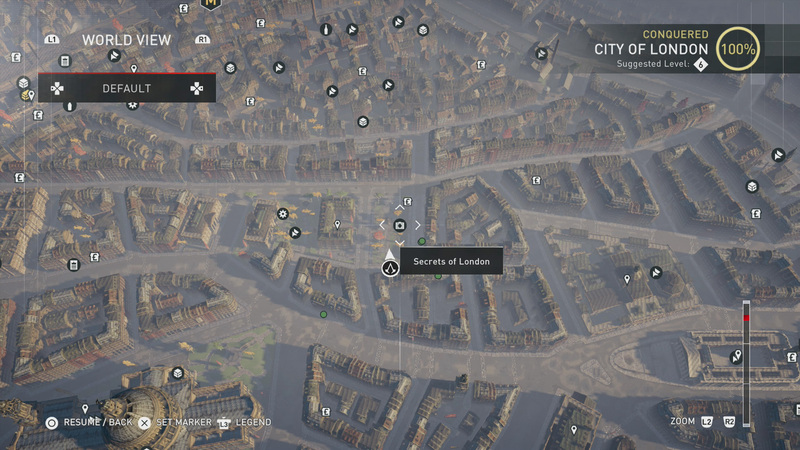 Our first Secret of London is found on the east side of Southwark. 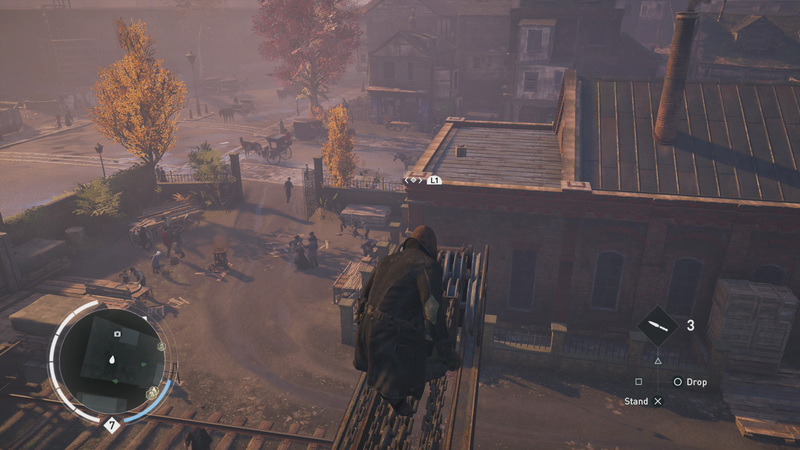 Look for a round platform just to the southeast of the train station. 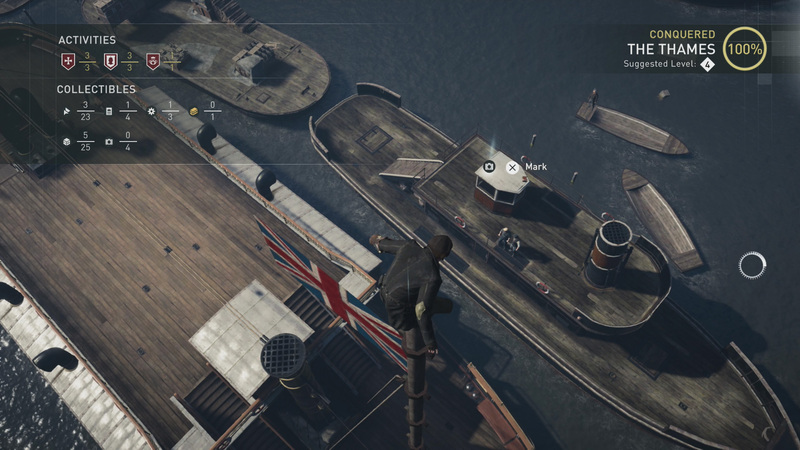 The collectible will be on the ground level. On the east side of Southwark you’ll find this Secret of London. Travel south along the tracks from the train station, looking to your right just after you pass a slight bend in the track. Find this Secret of London in the west part of Southwark. From the main train station, head northeast and across the main road. 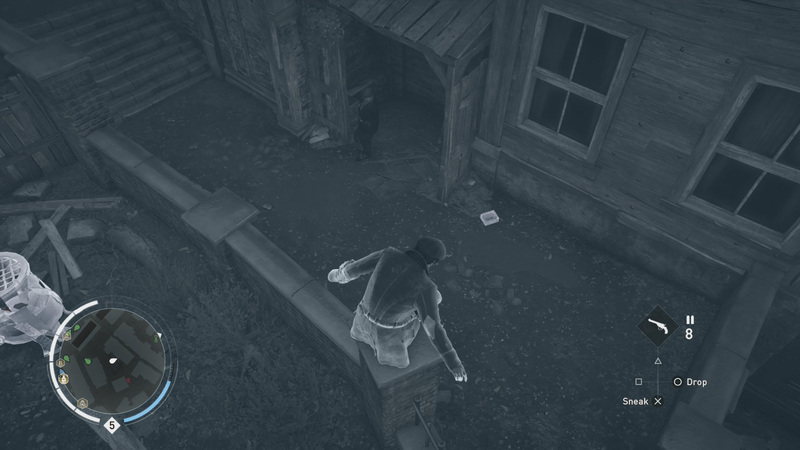 The collectible is nearby. This collectible can be found in the very southwest corner of Southwark. From the main train station, head to the south west until you reach the Southwark border. 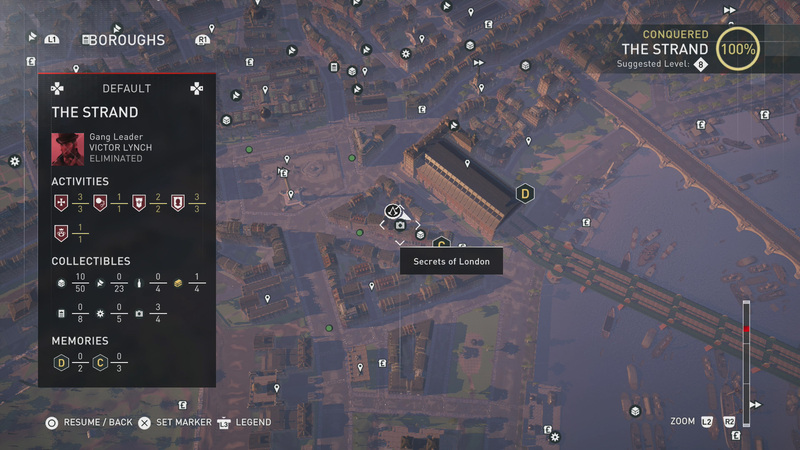 The Secret of London is nearby. 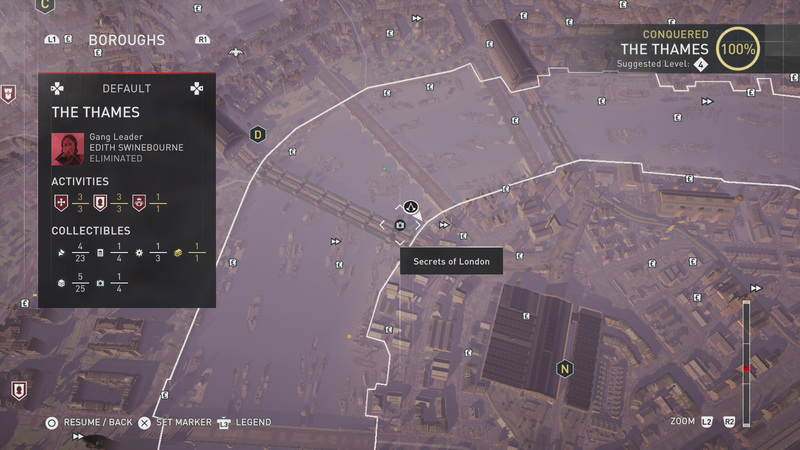 This secret of London is found just north of the first bridge (not railway) in the southern part of the Thames. 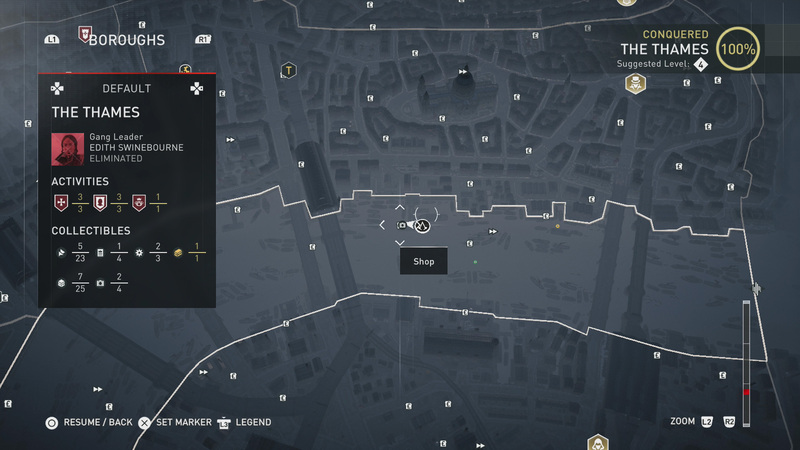 Look for a stationary boat with several smaller boats around it. 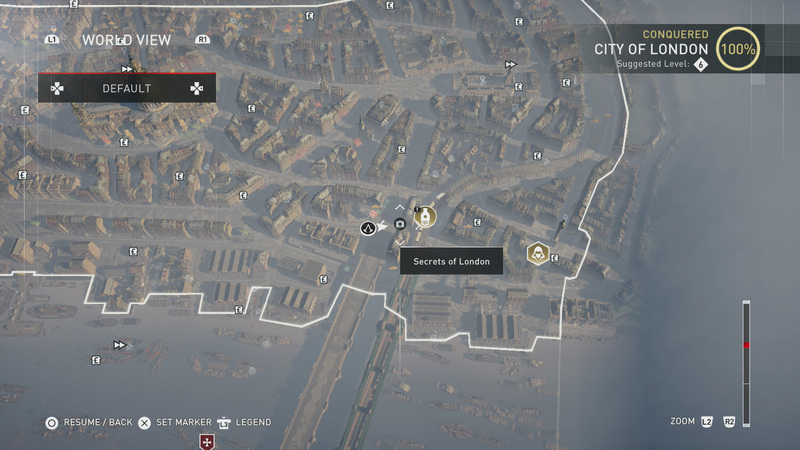 For this Secret of London, follow the Thames north until it begins to curve to the east. 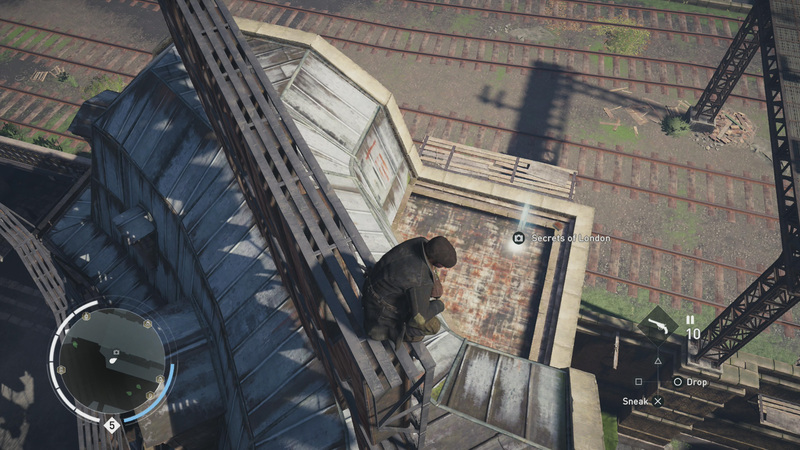 There is a railway bridge in the curve, and the collectible is on a pillar holding the bridge up. 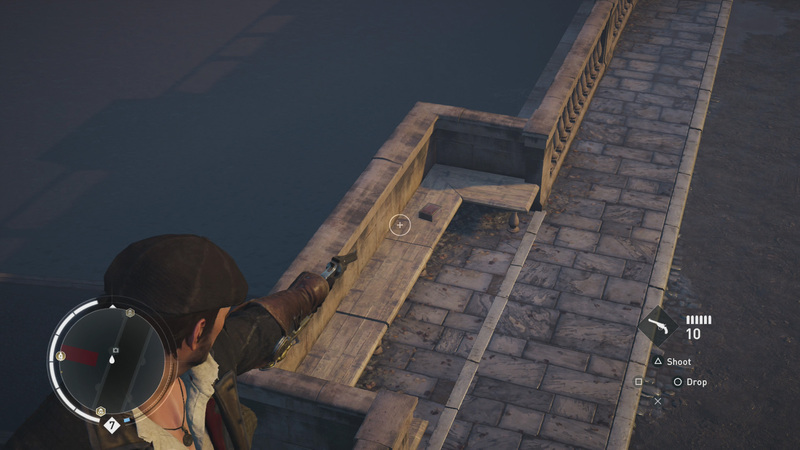 This collectible can be found after the Thames curves and begins moving east. Just after a railway bridge that signals the end of the curve, look for some boats along the northern shore. 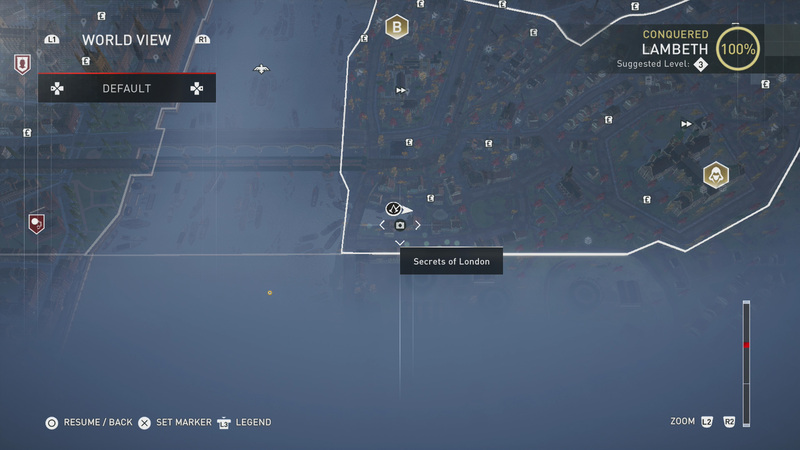 The final Secret of London on the Thames can be found on the final public bridge (not railway) to the east. 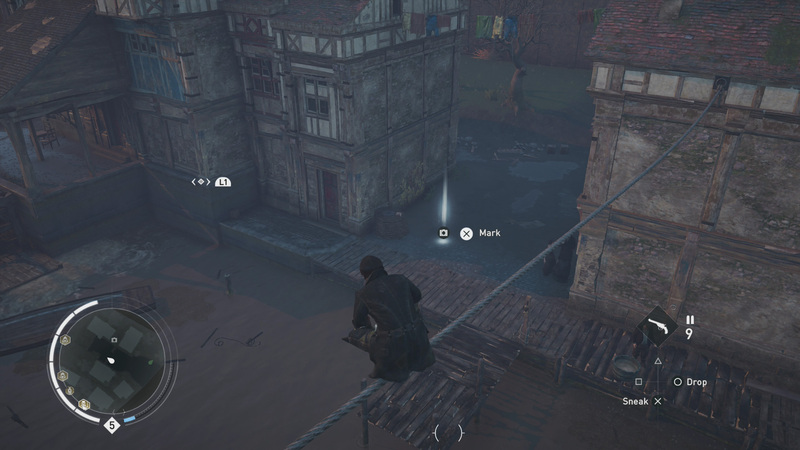 It’s actually on top of the bridge, about halfway across and on the left if you’re moving north. 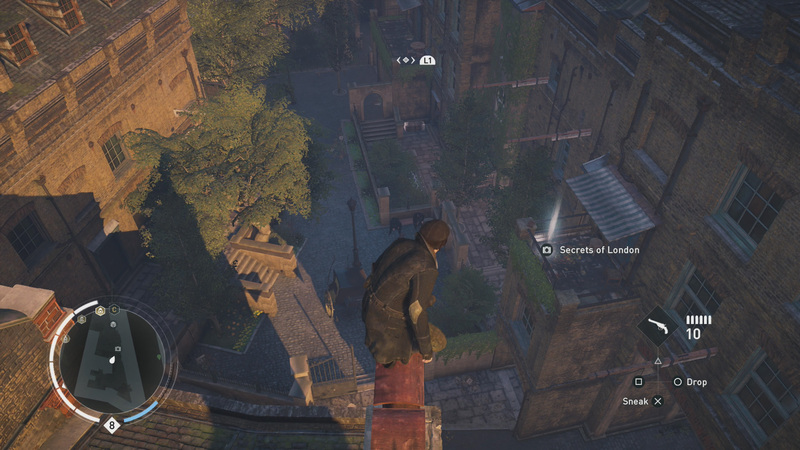 This Secret of London can be found near the northern railway station in the Strand borough. Head west from the station, looking for a small park with a gazeebo. The collectible is beside it. 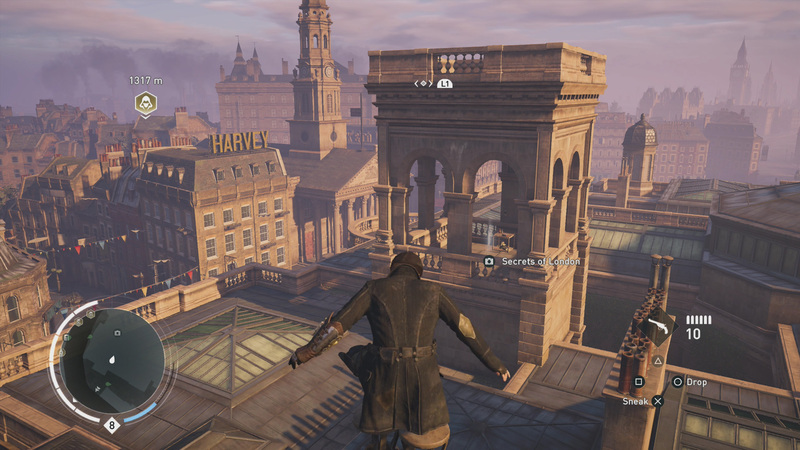 This collectible can be found to the north of the fast travel point on the far east side of the Strand. 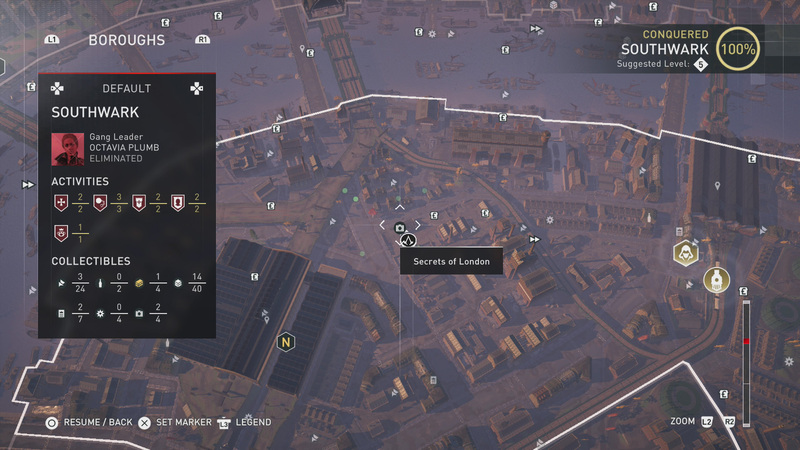 Head north a few streets to a large structure, and that’s where the Secret of London is. 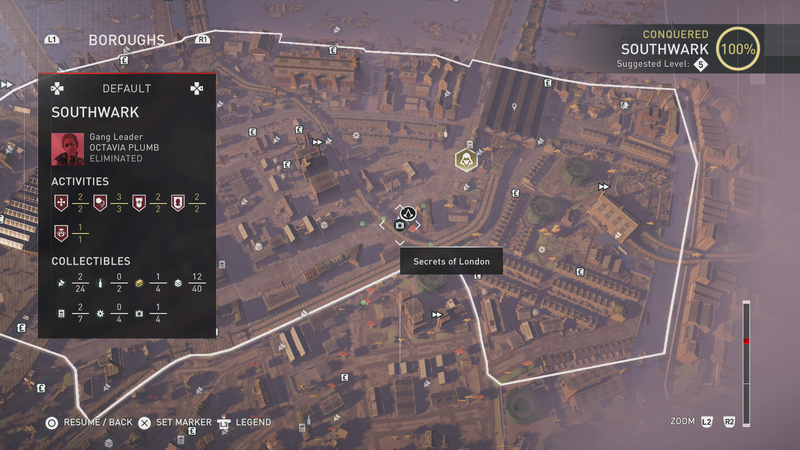 A Secret of London can be found just to the north of a fast travel point that sits on the very south side of the Strand. Head one block north and find the collectible on the northeast side. 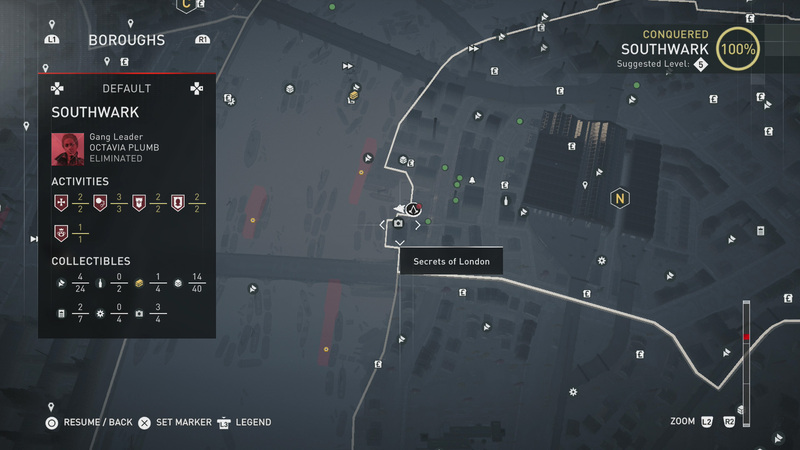 A final Secret of London can be found in the Strand. Look for the most southern railway station, heading southwest from it. Just across the street will be the final collectible for the borough. 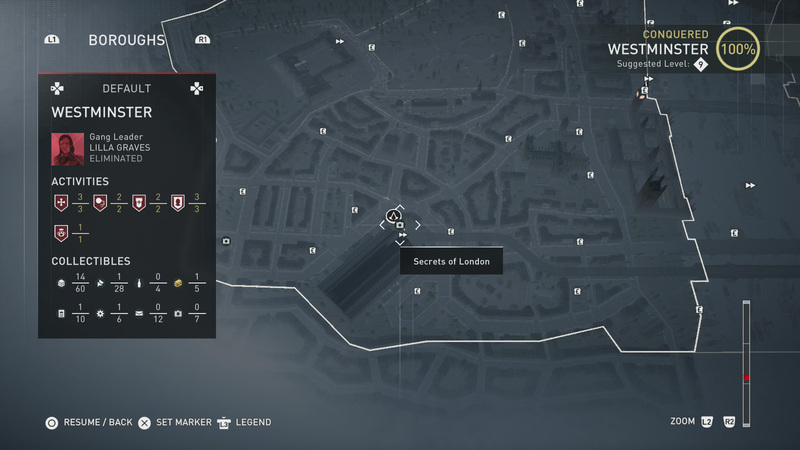 The first Secret of London in this borough is found on the northwest corner of the most southwest train station. Use your Eagle Vision to spot it if you’re having trouble. 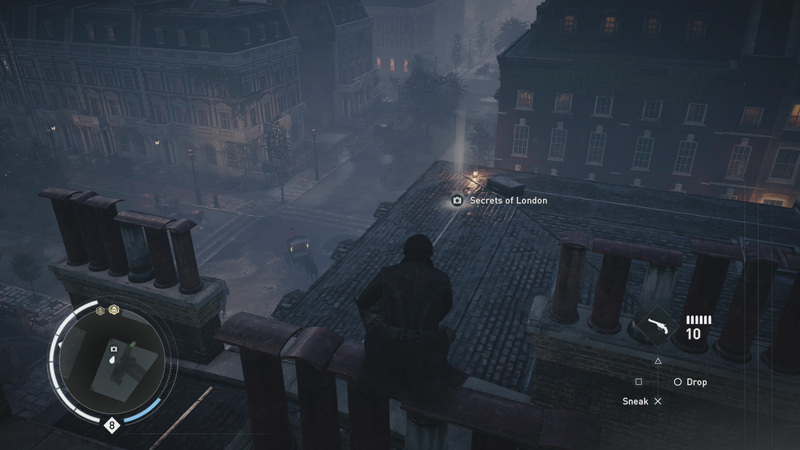 This collectible is found along the far west border of Westminster, just west of the most southern train station in the borough. 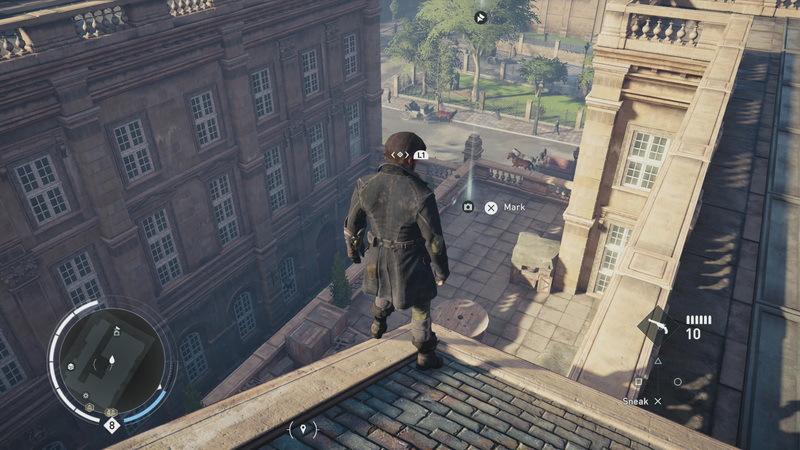 You can walk to it from the last collectible. 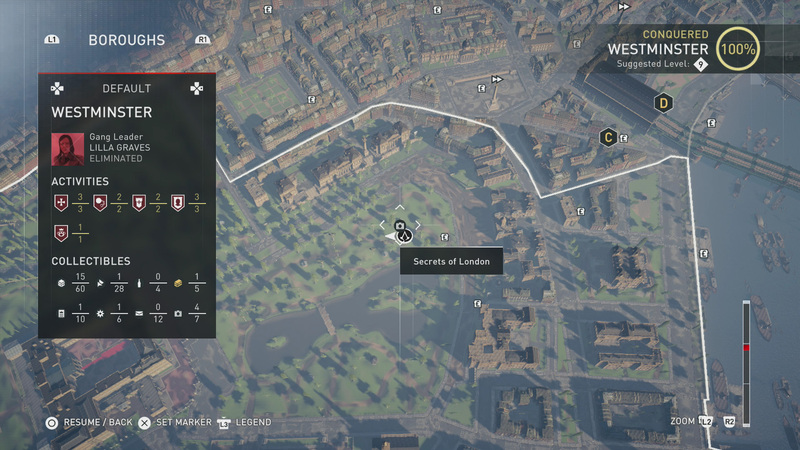 Another Secret of London can be found to the northwest of Buckingham Palace in the Westminster area. 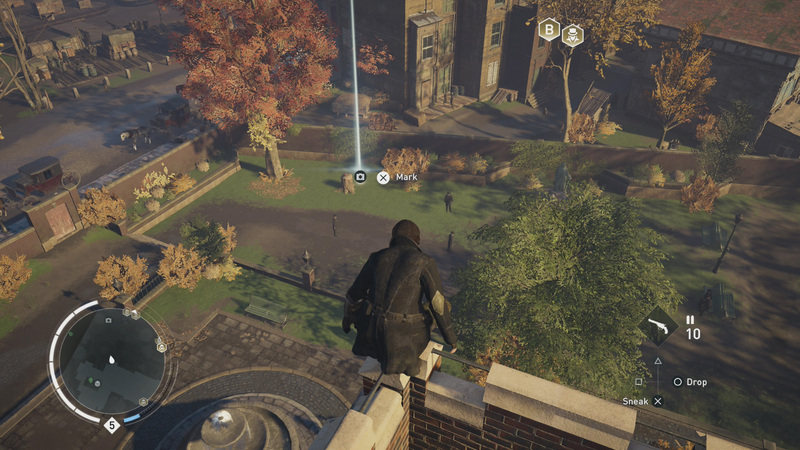 The collectible is just west of a walled in area on the north side of the road. For this Secret of London, head southeast from Buckingham Palace. 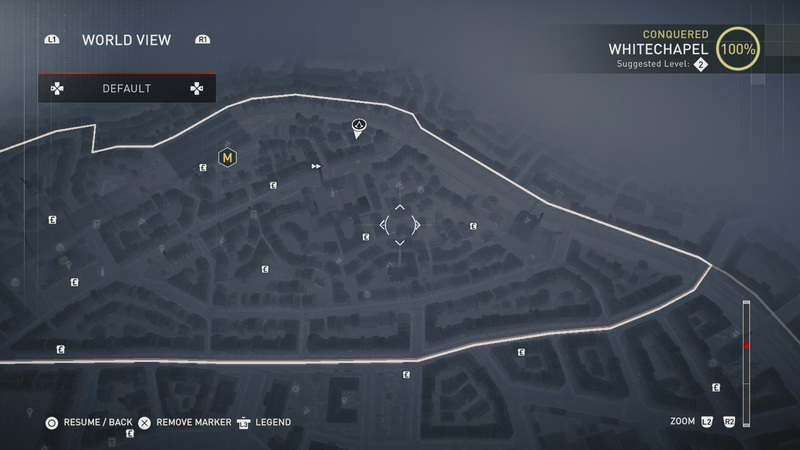 Just across the large road will be a tree (well, several), and near that tree will be the collectible you seek. 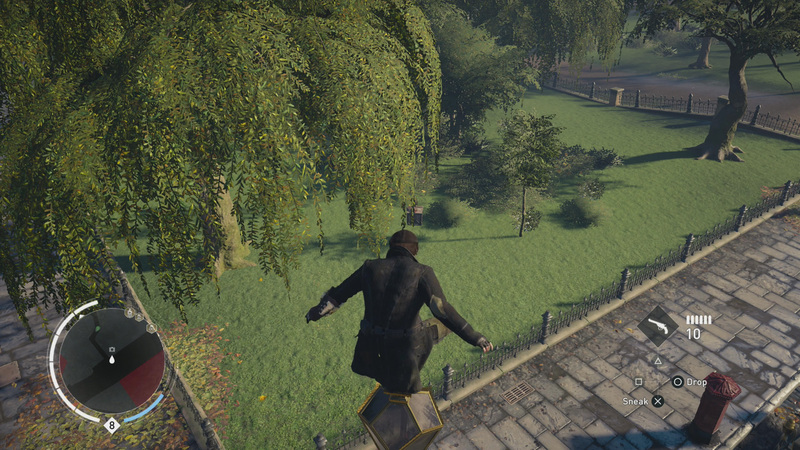 Find this collectible to the east of Buckingham Palace. Look for a lake and go to the northeast side of it. 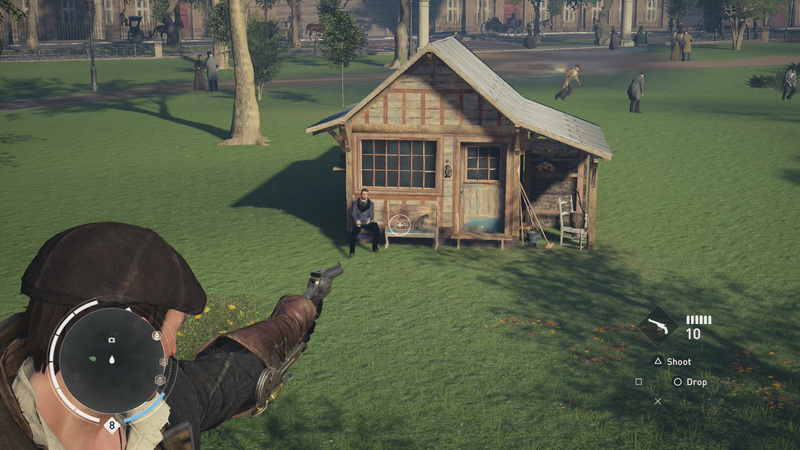 You’ll spot a small hut with a man and a cat (maybe) on a bench. 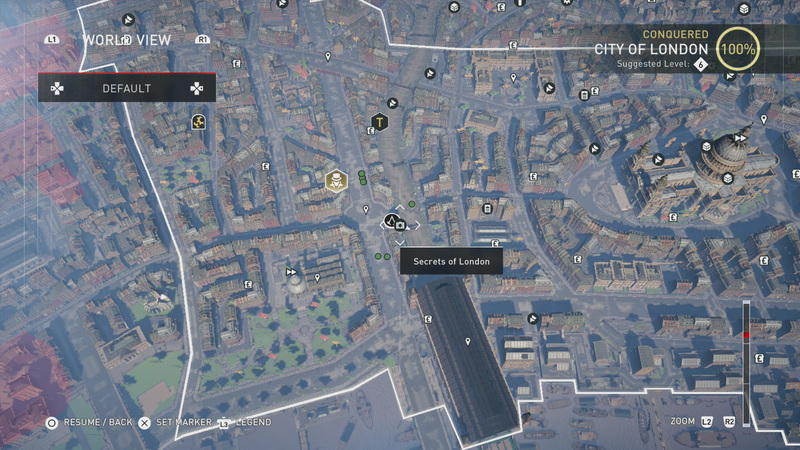 The Secret of London is there. This Secret of London is two blocks east of the pond near Buckingham Palace. 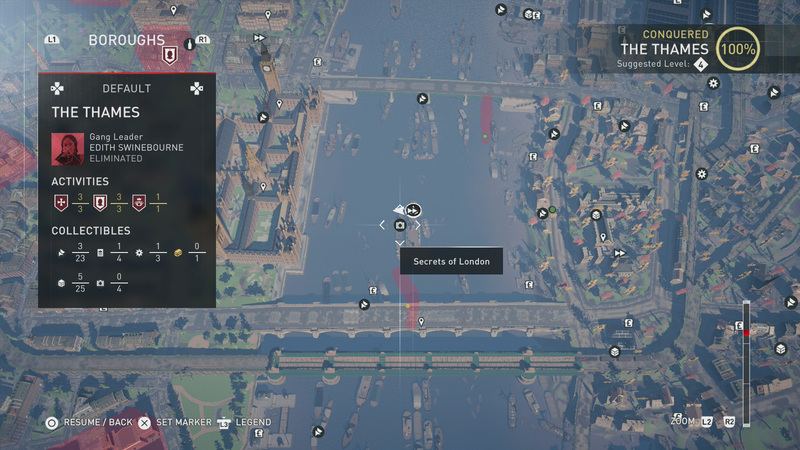 It’s the last block before you hit the Thames. 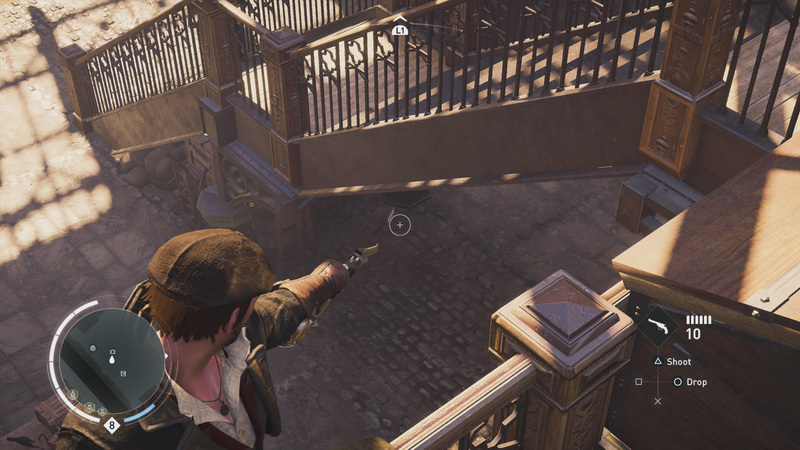 The collectible is located on a balcony. 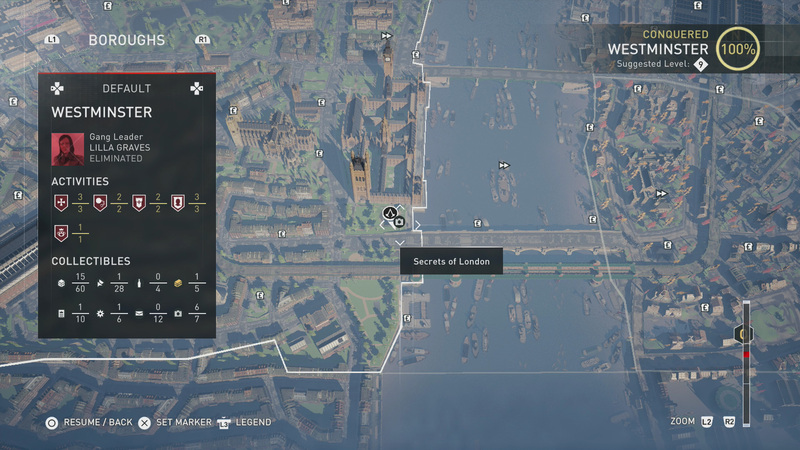 The final Secret of London that you need is found just off the northwest corner of the most southern bridge on the Thames. It’s in Westminster, but not by much. Look for a park. 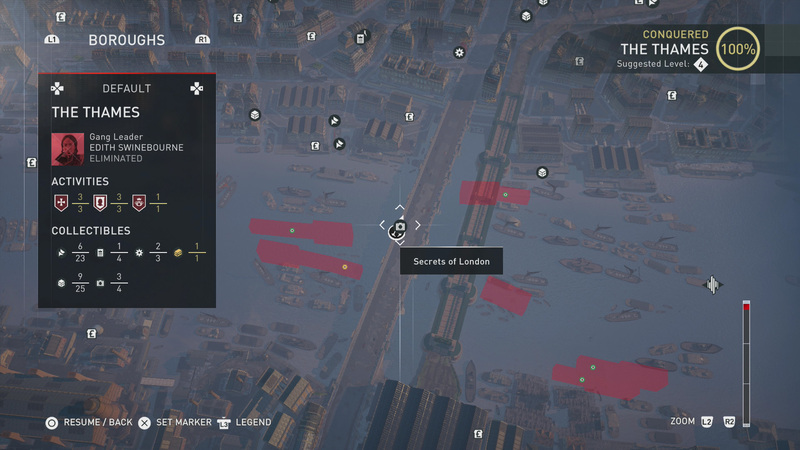 If you’ve been following along, you should have all of the Secrets of London that are required to unlock the Aegis. 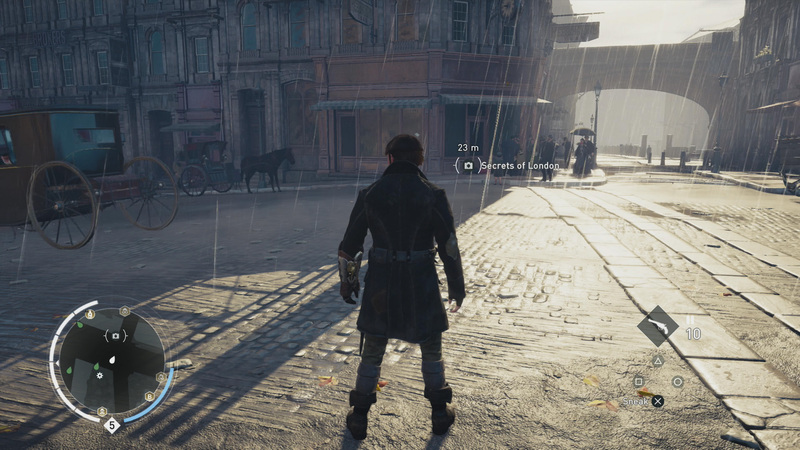 This outfit is exclusive to Evie, and will no doubt be one of the most sought after in the game. 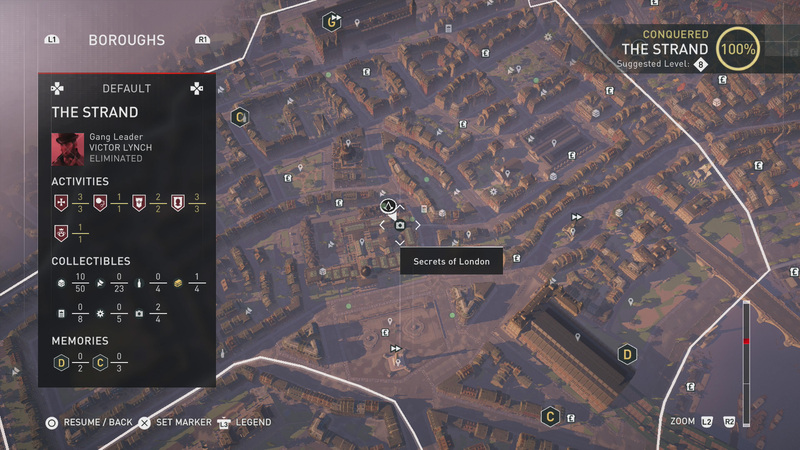 With all the collectibles in hand, return to Reuge’s Vault, placing the Secrets of London as instructed. 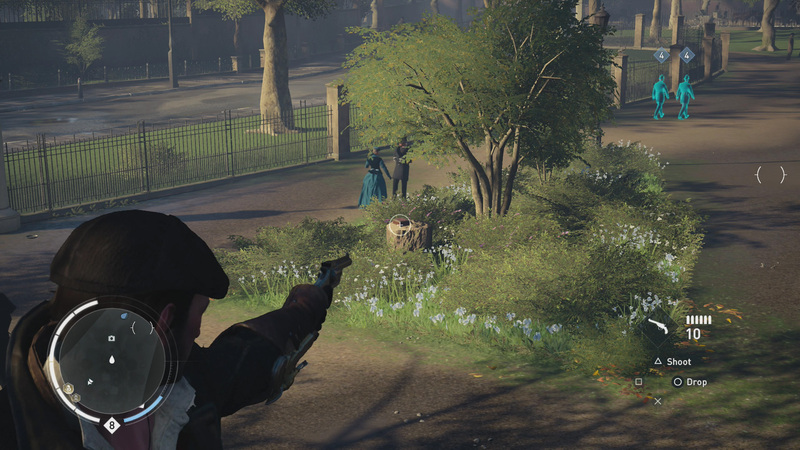 A cut scene will play where Evie and Jacob admire her new outfit, after which you’re free to try it out. 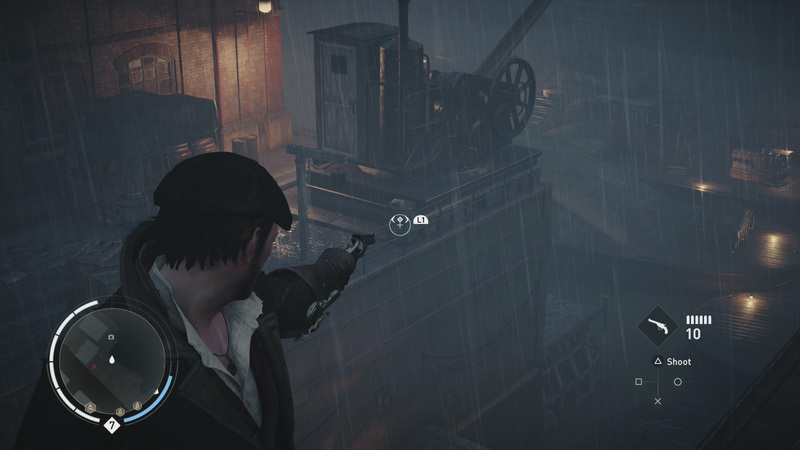 You’ll also score 4,000 XP and 4 Skill Points for your trouble, which should aid you in hitting the next level with each of your characters.